The Fayans Medieval Bone Handle Dagger has a Riveted Bone handle grip with brass guard. Blade 9 inches. Overall length 15 inches. Includes leather sheath. 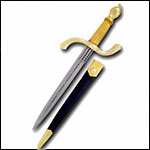 Our Crusader Dagger was designed to match our AH-3304 Crusader Sword. This medieval dagger comes with a wire wrapped grip, solid brass down-sloping guard and wheel pommel. Irish Gaelic-Norse Dagger with its characteristic Irish ring-pommel has a thick-edged blade forged from EN45 high carbon steel - its edges are blunted for stage and sport combat. The hilt is steel with wooden grip and bound in leather. Wooden scabbard is wrapped in leather. Our Main Gauche is designed to compliment any of our Renaissance rapiers. Leather wrapped grip with twisted copper wire. Steel pommel and ring cross guard is also wrapped in copper wire. Blade 14 1/5" Overall length 22". Our Rondel Dagger is a sidearm of the late middle ages. Carried by tradesmen to fully-armoured knights, the Rondel enjoyed a long service life. functional T-section blade is edged in 5160 high-carbon steel. The Late Medieval Dagger has a blunt blade for sport and stage combat. Steel hilt with wooden grip, covered in wrapped leather coard, treated with beeswax and shrunk for a quality, traditional finish. Scabbard included.